I have long tried to track down a good otak otak Muar shop since I first started Johor Kaki blog. 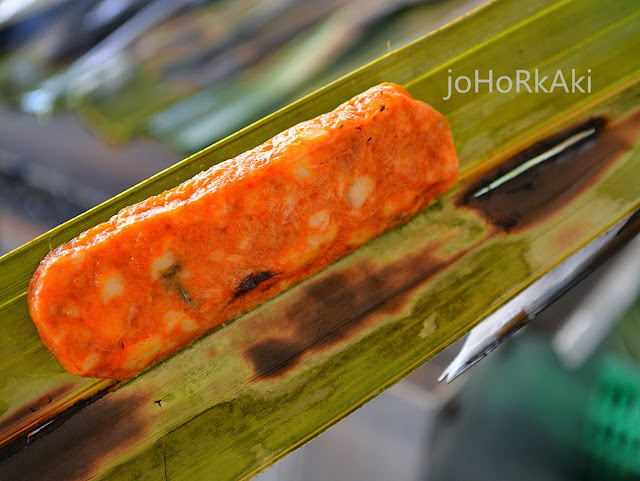 Till now, I haven't found an otak otak Muar that matches the best in Johor Bahru. I finally found it thanks to bloggie friend Tiffany whose extended family lives in Muar. 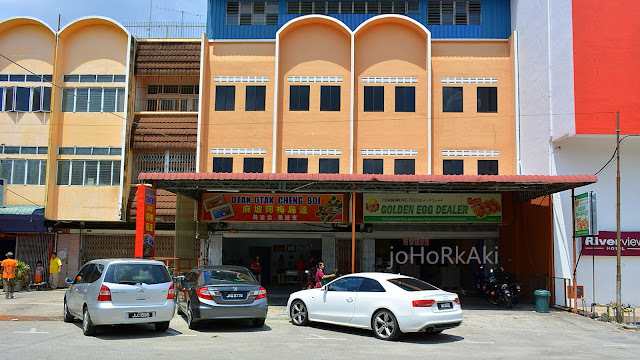 Tiffany's uncles and aunties run the famous Lau Lee fish ball noodle stalls 老李鱼丸面 in Muar. Tiffany, Yuki and I went hunting for otah otah in Muar. 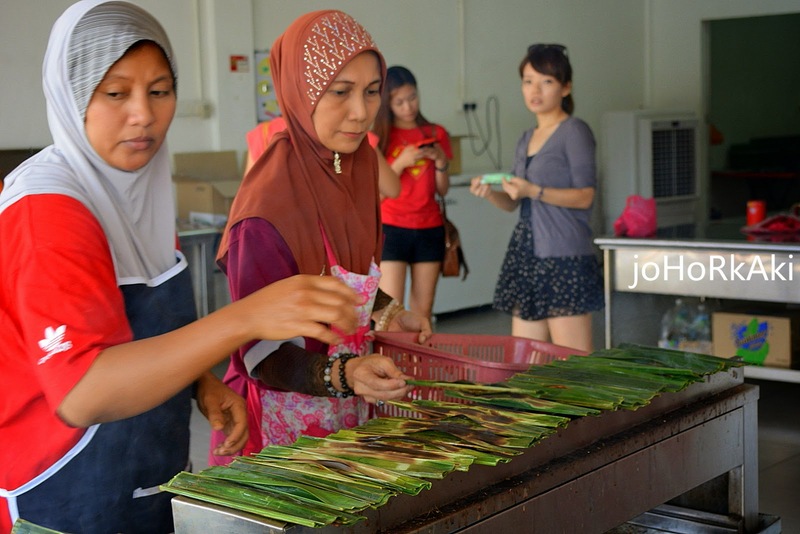 After trying a few otah otah shops, we like Otak Otak Muar Cheng Boi 阿梅乌达 the best. 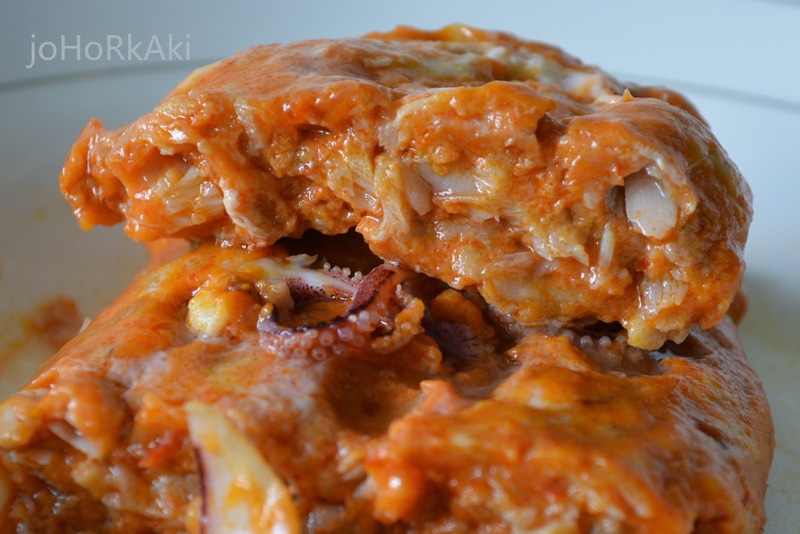 The otah otah are made with fresh mackerel fish, prawn or squid wrapped in coconut leaves with spices and coconut milk, and grilled right there at the shop. Cheng Boi's otak otak is quite thick, and it is floppy and bends easily because it is made mainly with real mackerel fish meat (not stiff starchy fillers). The curry flavour is mild so we can taste the freshness of the fish, prawns or squid. The best way to eat meaty otak otak fresh off the grill is to drop it straight down the hatch. I bought 10 frozen 200 gram slabs at RM6 (fish) and RM6.50 (shrimp or squid) each. I kept the slabs frozen in the freezer for over a week and steamed it just before eating. The meaty otak otak was still very pleasing. Not much flavour was lost by freezing and the meaty slabs were tender and juicy. 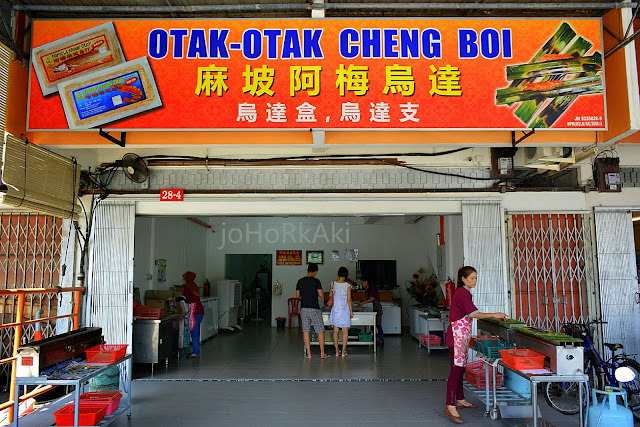 Next time you are in Muar or when you are otak otak shopping, look for the otak otak Cheng Boi 阿梅乌达 brand. I wanted to try but cannot confirm halal. Ask the staff replied not sure so I have to wait for halal confirmation then can try. 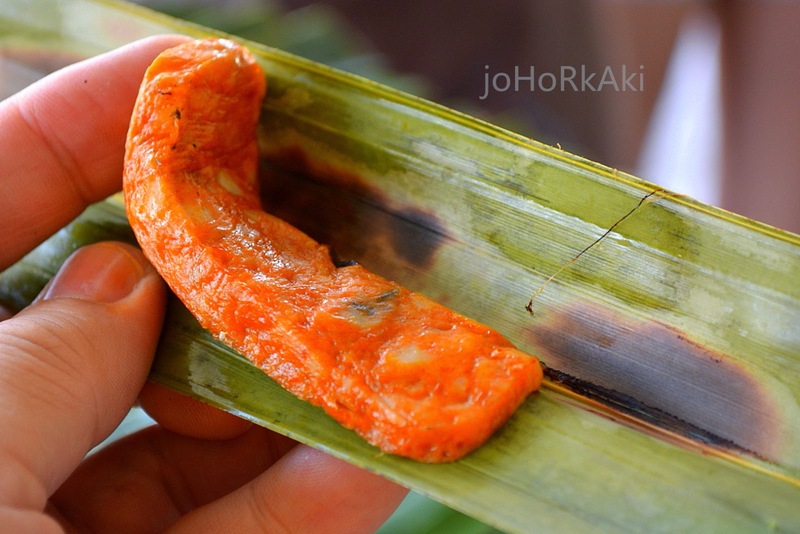 The otak otak is not clipped in coconut leaves but in atap leaves. Hi. I enjoy reading your blog very much and really appreciate how a non-Malaysian spent so much time into sharing our Malaysia good food! I am a half Muarian and never bought Cheng Boi before. Thanks to your blog article, I went to this shop with my husband to try. 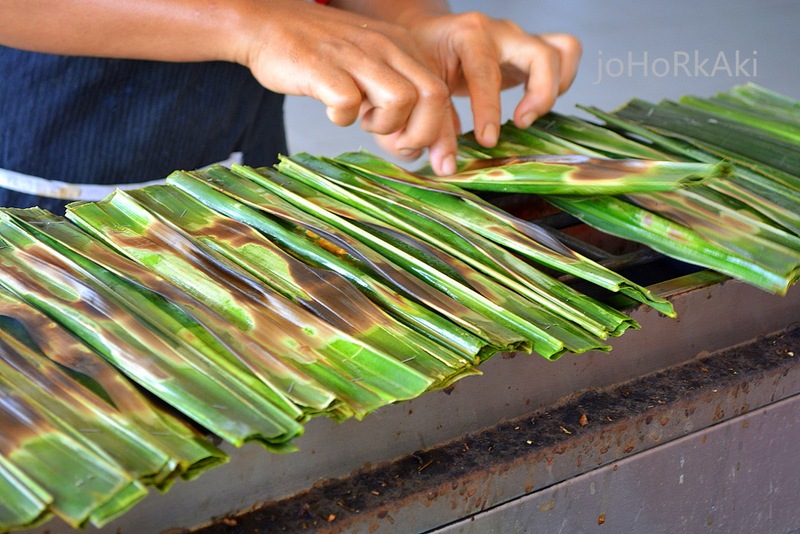 After trying out so many types of otak in Muar, I agree with you that this is the best in Muar. 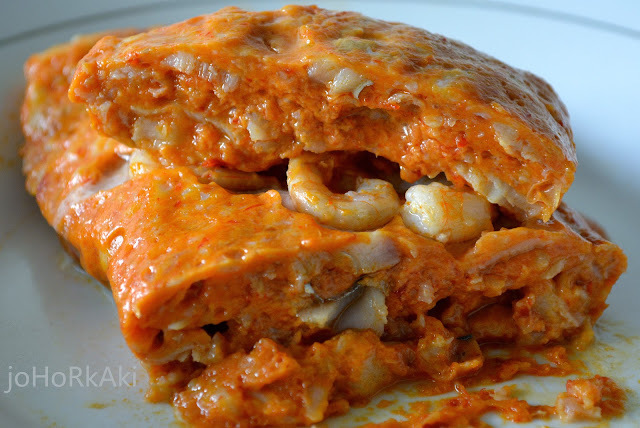 I wonder if the your personal taste of the 'best jb otak' is better than Cheng Boi, or both are equally good?